Do you have any idea about the amount of time that your workers spend in the washroom? It’s something that you might not be concerned about but when you learn how much time they actually use up while there you might change your mind. A global study revealed that workers spend, on average, 41 hours each year in the bathroom. That’s like a week’s worth of work. A place where people spend that much time is bound to have an influence on them. That’s the reason why Steve Jobs decided that there should only be two bathrooms in the whole Pixar facility. Jobs knew that bathrooms have the potential of bringing people together so they can exchange ideas. You don’t have to do something as drastic as that, but there are plenty of other bathroom design ideas that you can use. Designing a washroom may sound simple, but it’s actually no joke. It can really influence your employees. After all, it’s not all about functionality, but also about design, looks, style, atmosphere, hygiene, etc. You should have the following nine things in mind when thinking about your washroom design. You have to keep the air inside the washroom fresh and circulating. No one would be pleased to use and stay inside a washroom that stinks. They would try to avoid going there as long as they can. Good ventilators should be installed in your workplace washroom that would circulate the air inside. Aside from ventilators, you also have to use good quality air fresheners. You also have to be careful with the placement of the ventilators on the ceiling. Do not place the ventilator right above a stall. That can lead to some embarrassing scenarios for the users. You should think about investing in the best and newest technology on the market, when it comes to washrooms. For example, some employees would really prefer not to touch anything in the washroom. They want to avoid any potential way to contaminate themselves. That’s why getting as many touchless devices in your washroom can be a huge morale boost. Few people would disagree that music can help when it comes to relaxation. There are certain types of music that are just plain relaxing to those who listen. Of course, music. Music really can relax a person during a stressful workday, and can really boost morale. Now, of course, choose some classical music or jazz, since Death Metal may have quite the opposite effect. So why not stream some music in your washroom? Indeed, some employees instinctively go to the washroom to distress, or simply to walk around and get away from their computers. So why not get some music there? Now, we suggested jazz and classical music, but natural sounds, like flowing water, rustling of leaves and trees, things like that, will certainly help your employees out. This may sound very simple and obvious, but many companies forget about this. Namely, you should have properly built stalls at place in your washroom. Improperly set up stalls have a serious negative effect on the morale of your employees, and make your company seem very unprofessional. 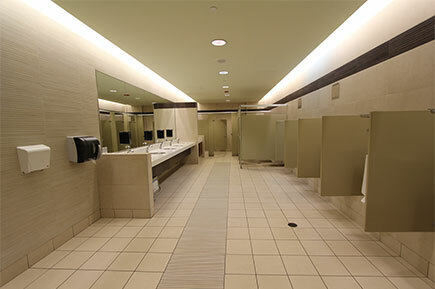 Now, lighting in a washroom should do more than just illuminate the actual room. It can have an effect on your employees in many ways. Proper lighting can help with a host of things. It can reduce stress, it can soothe a person and relax him or her. A good lighting setup can make turn a depressing and grim washroom into a place of peace. This along with music can really set up a nice mood and atmosphere. There are some companies that believe that hot water is a luxury, not a necessity. This will demoralize your employees, and make them think you are cheap and unprofessional. Now, of course, energy conservation and going green is important, very much so. However, there are other ways to stay green, ways that annoy your employees a bit less. Some workers get frustrated and stressed when they use the washroom and they find the toilet seats are dirty because of the people who used it before them. That sort of problem can be resolved by using seats that are kept upright so they don’t get soiled easily and by using toilet seat sanitizers. A typical door has to be handled by the knob in order to be opened. Can you see why that would be a problem in a washroom? Unfortunately, not all those who use the washroom wash their hands afterwards and if they have to open the door they could be spreading germs that way. The washroom doors should be designed in such a way that users would not have to touch and turn a knob when they are going out. You should use doors that swing outward without any knobs. You also have the option of dropping the use of doors altogether. You can avoid exposing the interior of the washroom by having a labyrinth entrance. Shelves inside the washroom can help workers who need some kind of temporary storage for their stuff. Placing hooks inside the washroom stalls where users can hang their bags and coats will also be appreciated. 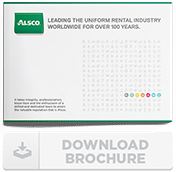 In the end, you can boost the overall experience that your workers can get from using the workplace washroom when you get a managed washroom service from Alsco. Keep your workplace fresh, clean and hygienic. Get Alsco’s fully managed washroom hygiene systems now. For more details, send us an inquiry.